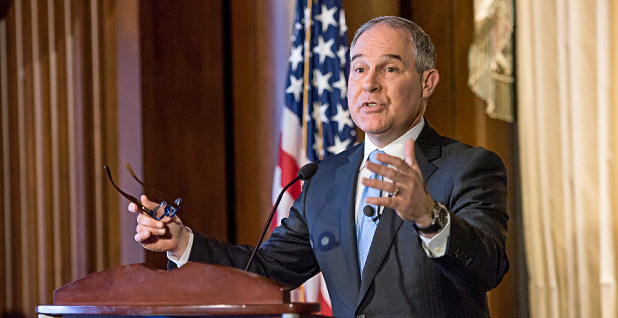 Is U.S. EPA Administrator Scott Pruitt going green? Photo courtesy of EPA. U.S. EPA Administrator Scott Pruitt is making the rounds in Washington to advocate for some state environmental funding that the White House has reportedly proposed to cut. Speaking first to reporters after the president's address to Congress on Wednesday and then before the U.S. Conference of Mayors yesterday, Pruitt reiterated that he wants to maintain funding to clean up brownfields and Superfund sites, meet unfulfilled air quality standards and keep paying for local water infrastructure. Pruitt asked mayors to bring him "success stories" to take to the White House Office of Management and Budget, which is drafting the president's proposed spending blueprint (Greenwire, March 2). An initial version of the budget proposal suggested reducing EPA's overall budget by one-fourth, cutting state air grants by 30 percent, eliminating 3,000 employees and zeroing out 38 programs, according to a summary being circulated by sources familiar with the plan. An EPA official who asked reporters not to identify him by name said yesterday that Pruitt made it clear that some of his budget priorities differ from the White House's draft. The official said he wouldn't characterize Pruitt's concerns as "pushback." He noted that there are some programs both Pruitt and members of Congress want to keep around. "There's going to be back-and-forth," he said. While Pruitt is doing damage control and touting his support of some of the money that goes to states, he hasn't addressed funding for other issues reportedly on the chopping block. These range from climate change and environmental justice to the largely successful Diesel Emissions Reduction Act and Energy Star programs. In resistance to those proposed cuts, EPA employees protested in Chicago yesterday, and federal agency staffers rallied at the Capitol (see related story). John O'Grady, an EPA union leader, said Pruitt's support for some programs is doing "nothing to allay" the fears of agency employees. "EPA is full of very well educated and dedicated attorneys, biologists, chemists, ecologists, engineers, geologists, toxicologists, and other highly skilled professionals who are able to 'read between the lines,'" O'Grady said in an email. "Mr. Pruitt is here at US EPA to deconstruct the US EPA." Myron Ebell, who works at the Competitive Enterprise Institute and advised Trump's EPA transition, said the overall budget reductions would be "applying market discipline to a bloated bureaucracy." "A 24 percent cut is a good target, although the specifics of the cuts should be carefully considered and revised if needed. If members of the House and Senate Appropriations committees want to increase spending on specific programs, they should justify it and find comparable savings in other programs," Ebell said. Ebell argued that EPA has more employees than it needs, especially because much of its work has shifted to states. He called EPA "top-heavy" and argued for downsizing regional offices. State regulators disagree, saying they need money from the agency to carry out the work required of them. State agencies have noted that the initial cuts laid out by the White House would slash their grants for maintaining air and water quality and cleaning up hazardous waste by between 30 and 40 percent. The blueprint would leave in place state revolving funds for clean water and drinking water, which pay for infrastructure, according to a source who has seen the White House document. The grants are "generally money going to hire people to enforce the law, to write rules, to inspect facilities, to respond to citizens' complaints, to help industry," said Bill Becker, head of the National Association of Clean Air Agencies. Becker said it's laudable for Pruitt to want to keep in place the state revolving funds for water infrastructure, "but to cut state air grants by 30 percent at a time when they're underfunded already, and talking about delegating more responsibility to our [state] agencies, seems extremely unfair and harmful to the environment." The Environmental Council of the States, which represents state environmental agencies, raised concerns in a letter to Pruitt and the White House budget director yesterday. Alexandra Dunn, executive director and general counsel at ECOS, said EPA received the letter and is working hard on the budget issue. ECOS is proceeding to set up meetings with OMB's Office of Information and Regulatory Affairs, she said. Dunn said the grants in jeopardy represent the "core operational funds" states use to carry out the 95 to 96 percent of federal programs that the U.S. government has asked them to run. Funding for those grants has not increased in years, even with inflation and as the federal government has imposed new standards for states to enforce. States are already filling the gap. Most legislatures are meeting now and would have to come back in special session to provide more environmental protection funding if Trump and Congress were to cut federal dollars, Dunn said. "The reality is that the cost will come from somewhere," Dunn said, noting that states would likely raise fees on regulated companies. Dunn said she's been told the White House will finish writing its budget by March 16, giving states and Pruitt two weeks to try to change minds. She noted that in early communications with EPA's beachhead team, she got the sense that the agency understood that in order to give more authority to the states, it would have to continue to send them money. "So it was a surprise, to say the least, to then learn of a proposal which came from OMB to cut the state grants," she said. "There were many states very encouraged by the agenda of re-empowering the states, and I think that what I sense is people are now processing how that becomes a reality if the federal fiscal flow of money dramatically changes," she added. Beyond grants to states, EPA could see huge cuts to science, former EPA Administrator Gina McCarthy said on MSNBC on Wednesday. She said the agency could lose 42 percent of scientists with funding reductions to EPA's Office of Research and Development. "I mean, this is not just disagreeing with the science and wanting to deny it. This is telling half of the scientists that they are no longer welcome in the premier science agency in the world, the Environmental Protection Agency," McCarthy said.